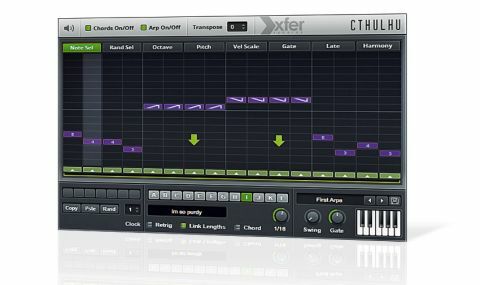 A wicked MIDI-generating plugin, Cthulhu makes conjuring up instant chords and melodies a snap. Inspirational. Terrific collection of chords. Awesome arpeggiator. Great price. Chord generator is educational. Won't actually eat you or drive you mad. Hard to get working in Logic. It was inevitable that someone would one day release a plugin named after HP Lovecraft's flagship cosmic deity, though we fully expected any so-named instrument to be aimed at the noise or industrial markets. Instead, Cthulhu is a rolling, rocking, pulsing inspiration machine with a split personality. "Once you start digging around, you'll find a wealth of inspirational features"
On its simplest level, it's an instant chord creator, spitting out chords when single note-on commands are received. It'll also perform the reverse operation, churning out arpeggiated patterns when a chord is played. It doesn't make any sound on its own (other than a simple test signal, if you want it), but instead drives other plugins (or hardware) via MIDI. So far, so pedestrian, but as we said, this is Cthulhu at its simplest - once you start digging around, you'll find a wealth of inspirational features, all thoughtfully designed to transform even the most rudimentary hunt-and-peck keyboard performance into a musical masterwork. Lovecraft's gods were pre-historic and forgotten, but Xfer draw upon slightly less ancient figures, primarily Bach, whose chorales are represented among the collected presets of Cthulhu's Chords module. Papa Bach's 168 patches are joined by those based on Schubert, Mozart, Debussy and more. The classical training of Xfer Records mainman Steve Duda is showing through here, and we're grateful for that. Better still, you're not limited to the preset chords - you can also create your own or edit what's already there. Chords are assigned to Chord Slots, each of which can be assigned to a key. There are 128 slots - one for each MIDI note number. You can view the notes that make up a chord via the virtual keyboard or in the panel just above it. Chords can be copied and pasted or learned from any notes you trigger, and there's a WTF button for generating them randomly. "Cthulhu's Arpeggiator is light years beyond the usual up/down/random or even simple pattern-based arpeggiators"
Cthulhu's Arpeggiator is light years beyond the usual up/down/random or even simple pattern-based arpeggiators to which we've grown accustomed. Using the graph, you can tell Cthulhu what it should do on every step of the pattern. You can select from all the usual arpeggiator patterns (up, down, up/down, down/ up, up+down, down+up) as well as fingered top and fingered bottom, which will play the highest or lowest note of a chord on every other note. You can also select numerical options, which will play the designated note of the chord on that step. For example, a selection of '3' will play the third-highest note held. Steps can be muted, and Alt-clicking a step will cause the pattern to reset to the beginning on that step. Patterns can be copied, pasted and randomised, and you can take control over the clock division, swing, gate and more. Cthulhu performs exactly as advertised. It offers quick and easy solutions to musical quandaries and, more importantly, inspires new directions. It's not without its problems, though. Logic users will want to weigh the added hassles of using it in an environment that is less-than- friendly to MIDI plugins (note that this is a Logic problem, not a shortcoming of Cthulhu). Still, for what it does, Cthulhu comes in at a ridiculously low price, assuming you don't own something that can do most of what it does already. To our minds, it's worth 40 bucks for its educational value alone.